Ever since Saltillo’s debut album released in 2006, fans have craved more of his unique music. The mind behind Saltillo, (Menton J. Matthews III), weaves together urban beats, sound bytes, and classic orchestra to create a distinctive form of trip-hop. This unusual style made him renown among fans of the genre. As the years flew by, it was beginning to look like Matthews might not make more music. Fans began to accept Ganglion as Saltillo’s first and last album. Then this February, Monocyte was released and swiftly devoured by his fans. It was intended to be a soundtrack to Matthews’ comic book series of the same name. 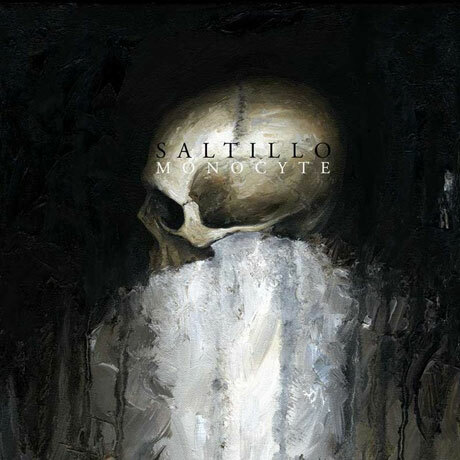 But the question still loomed: Would Saltillo’s sophomore album be a disappointment compared to his debut? Monocyte opens with “Abeo,” a track that can be best described as a miasma of despair. Haunting strings are incorporated with long droning notes and a distorted dialogue about death to create a rather terrifying beginning to the album. It sets the dark, sometimes downright morbid tone that continues throughout the album. Unlike Ganglion, which had a much more classically beautiful sound, Monocyte combines distorted industrial beats with dramatic, high-note string music. Audio samples that deal with questions of existence and mortality are then integrated in, creating unique compositions that are a feast for the ears. The album is incredibly atmospheric, with each track carrying its own mood. All of these bleed into one another, painting a macabre picture that can sometimes be overwhelming. Grainy beats evoke the futuristic setting of the comic book, while dramatic orchestral elements provide dark beauty and kinetic energy. Tracks like “Proxy” and “Forced Vision” take advantage of the stark contrast between the electronic and classical components to build up power and emotion into the song. The mixed sound samples also help emphasize the individualistic moods of each track. No song uses the sound bytes better than “I Hate You,” where a man discusses the human fear of being mocked, followed by exaggerated, warped samples of a crowd laughing. The result is a morbid mixture that I would expect to find on the soundtrack for a psychological thriller. Sarah Matthews, the female vocalist from Ganglion, is still present in Monocyte, but her role is much more understated than in Saltillo’s debut. Though her voice retains that beautifully sorrowful quality to it, a new sense of desperation seems to find its way into her voice, fitting the mood of the new album. She is only used in the two quieter tracks, and her voice soothes the intensity of the music. However, these songs still fit into the overarching picture Saltillo paints with Monocyte. These lulls are needed between the other emotionally tumultuous songs to keep the listener from becoming exhausted. Though Monocyte is meant to be a soundtrack for a comic book, the album stands alone as an individual work. While it has a markedly darker tone than Ganglion, it does not deviate from Saltillo’s unique style. It shows a new face to an already innovative artist. This is an undoubtedly a good thing — even if this new face is twisted and difficult to look upon at times.